The first photo above has haunted me ever since I first saw it at 13th and Wolf. It’s what I would consider the perfect fall tie. 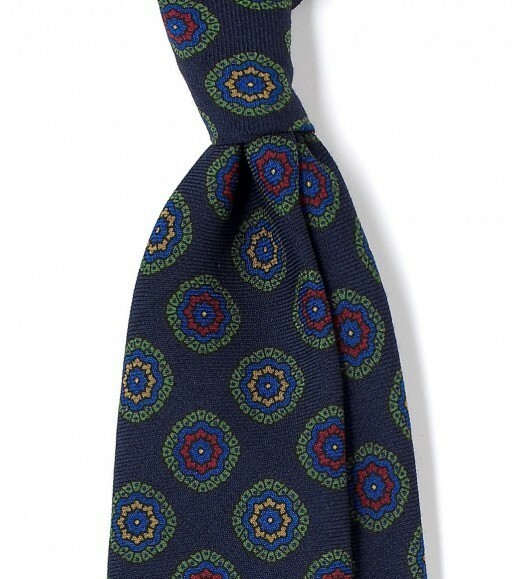 The colors are warm, the pattern is simple but interesting, and the wool fabric gives the tie a nice, soft appearance. Together, these characteristics make it the perfect expression of fall. 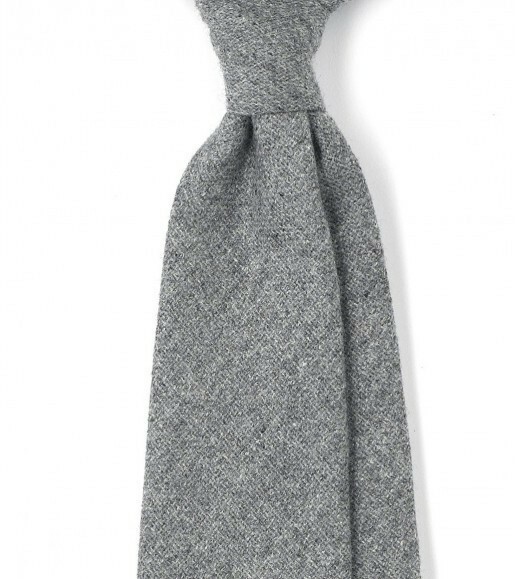 Most of your seasonal ties for fall should be made (at least in part) out wool. These can come in many forms – wool challis, wool flannel, tweed, etc. Challis is a plain weave that feels supple and lightweight; flannel will have a soft, brushed nap; and tweed will be a bit rougher. 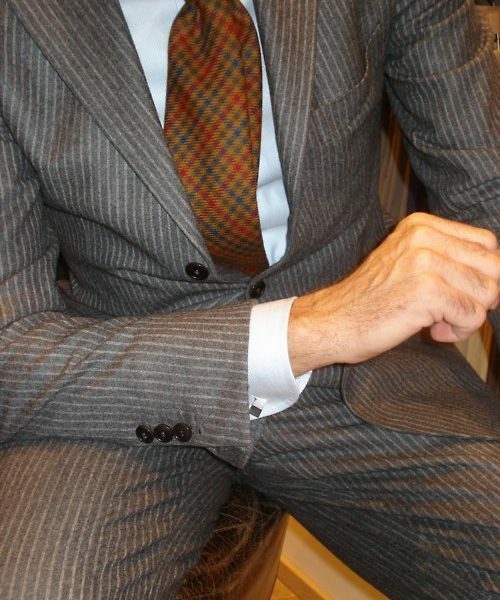 Like with silk ties, a solid color can work well if the fabric has a bit of texture to it (eg brushed flannel). 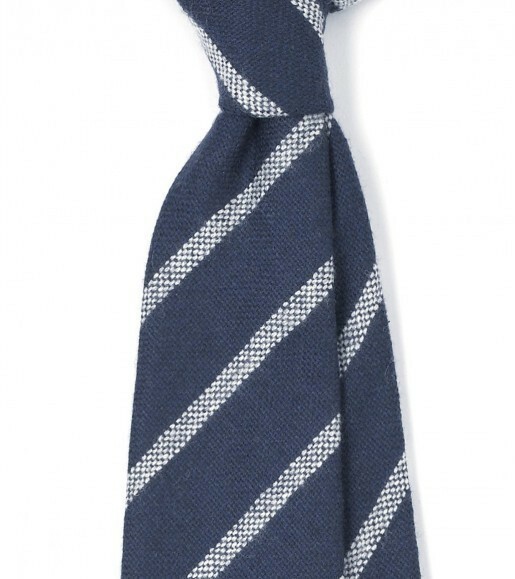 For something slightly more interesting, you can also get a plain colored tie, but one with a slightly mottled weave or herringbone pattern. 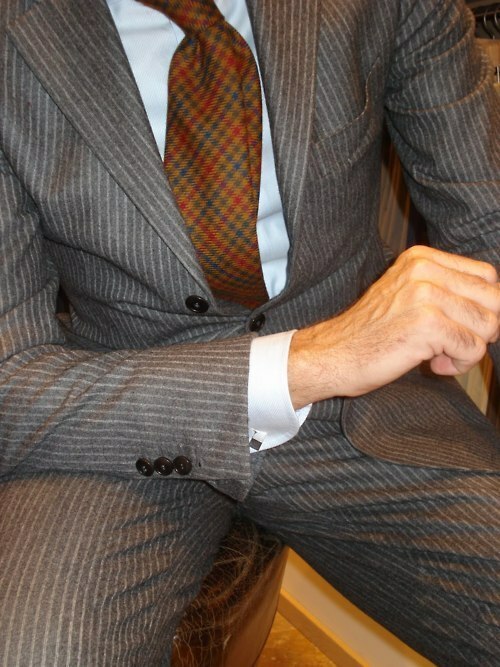 My favorites, however, are wool ties with small geometric patterns, stripes, or checks such as windowpanes. A number of tweed ties also come speckled, which can be interesting. Like wool ties, cashmere ties also make for excellent fall staples. Since the material is more luxurious, they will typically cost a bit more than wool, however. Since they’re softer, they also don’t typically wear as well. 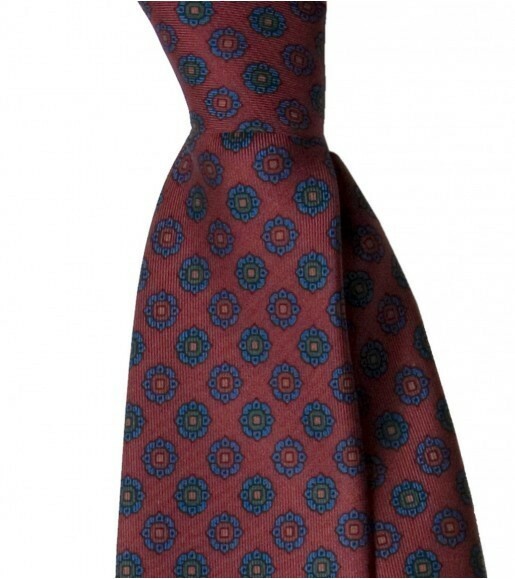 Another traditional fall tie is the ancient madder. 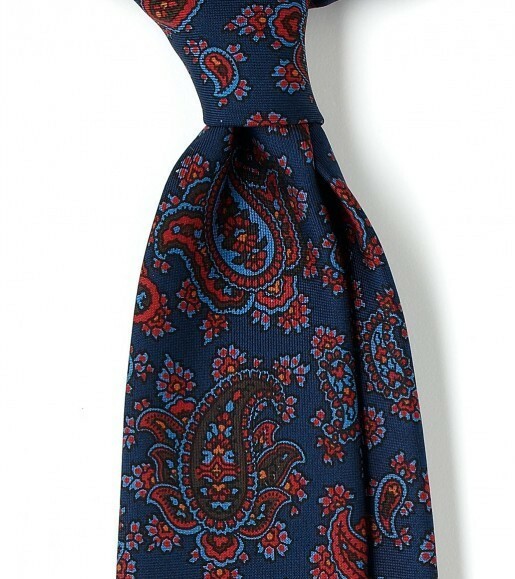 Ancient madder ties are distinguished by their muted hues, traditional patterns (often with paisleys) and their soft, matte finish. You’ll find beautifully deep, soft, matte colorings, such as mustard yellow, jade green, and indigo blue. They’re produced on a special “gum” silk, and when handled, they have a hefty, chalky hand similar to fine suede. They can come in paisley or any number of small, geometric designs. I had a phase once where I went a little tartan crazy. Now I find that with the exception of black watch, it’s hard to wear tartan ties. However, one thing they go excellently with is a tweed jacket. It makes sense given how popular the two are in Scotland. If you own a tweed jacket, I don’t recommend you go out and buy ten tartan ties like I did, but maybe buy one. 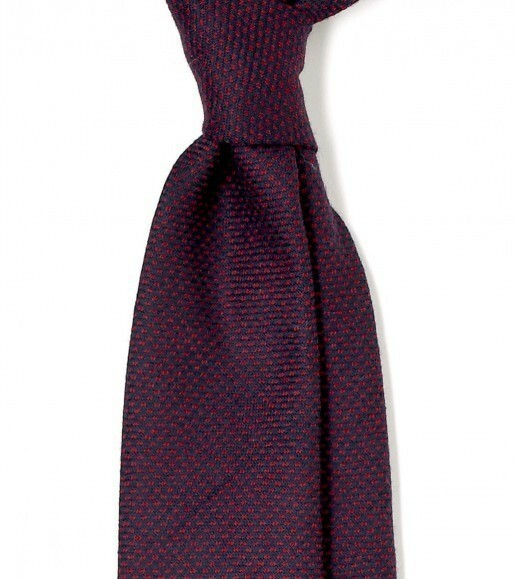 Your regular run of woven silk ties can still feel seasonal. Just keep your colors autumnal – burgundy, chocolate, hunter green, and pale gold are all good colors to stand by. So where to buy some of these ties? My favorite shops are Drake’s (pictured above), Sam Hober, Paul Stuart, Ralph Lauren, and J Press. Additionally, some excellent options are available at Howard Yount, Mountain and Sackett, and Ovadia and Sons. For those looking for something more affordable, Land’s End also has a couple of handsome wools for between $50 and $60. Finally, note that seasonal ties aren’t a necessity. You can still obviously wear your regular rotation of silk ties – grenadines and knits are still great ties to wear regardless of the season. It’s just that having a seasonal touch here and there can be fun, and the above are good options to consider.